If I had to pick my favorite city in America, I would probably pick Charleston, South Carolina or Santa Barbara, California. After only two trips to Charleston, I am completely head over heels for it. If you’ve been, then I’m sure you can understand why. If you haven’t been, you should go! Charleston seems to be the “talk of the town” and it’s for very good reason. It’s filled to the brim with southern charm, every pastel color you could dream of, an amazing culinary and mixology scene, plus so much more. I’ve already done two travel guides to Charleston from my first trip but felt the need to do another one from my second trip because there were some new places I went to that were SO GOOD. I also went during a different time of the year (November vs. August) and the weather was literally perfect and I’m such a sucker for all the pumpkins on the porches. You can see my other Charleston Guides here and here. The first thing I can say about FIG is that their service is INCREDIBLE. I’m not sure I’ve had a better dining experience solely based off the service. For starters, we made reservations at the wrong FIG. The reservations I made ended up being at another restaurant named FIG somewhere in Georgia. This particular night there were no tables available but the hostess felt bad and wanted to help so she worked some kind of magic and got us a table. Next, our waiter was just the sweetest. He had actually moved from the Bay Area years before so we had a lot to chat about. He also comped a few desserts for us. Also, the food is amazing. The one thing you MUST order off the menu is the Yukon Gold Potato Puree, you’ll be licking your plate and thanking me later. This is my second time eating at Cannon Green and I can honestly say this is my favorite restaurant that I’ve been to in all of Charleston. Ryan and I went the first time and he agreed it was his favorite and my friends I went with the second time also agreed it was the best. I love the interior of the restaurant and the ambiance at night. It doesn’t matter what dish you get here because anything you order is going to be good. The menu constantly changes based off of what’s in season but I can tell you that I’ve had both beef and seafood and both are stellar. Meat sweats anyone?? No really though….it’s a thing, I didn’t know what that actually meant until after eating here. I am not a BBQ expert but I thought Lewis’ was just as good if not better than the BBQ I had in Texas. Plus their queso was insanely good. It’s super casual where you walk to one window and order your food, then go to a separate bar if you want a cocktail. They lay large butcher paper in the center of the table and you just kind of “put it all out there” and have one by family style meat fest….at least that’s what we did. Again with the cutest interior decor, this place just nailed it. The colors, the decor, the theme, everything about it is so on point! Just by looking at the website you know it’s going to be cute. It’s located right on King Street so it’s the perfect place to start the day if you plan on hitting King Street and if you’re looking for a seafood brunch. The chowder fries are to die for, honestly one of the best dishes I’ve had (perfect for the hangover from all the frosé at Skinny Dip the day before, haha). I have to say, this restaurant was on the bottom of my list of places to try but I’m SO glad we went.The decor is super cozy and makes you want to stay for a while. This meal gave Cannon Green a run for its money. They may have the best truffle fries I’ve ever had, you need to have these if you go. I went with the wreckfish for my entrée and did not leave disappointed. I dream of a Caviar and Bananas coming to California….is that weird? It probably is but I love this place! It’s a cafe along with a gourmet market where you end up wanting to eat and buy all the gourmet goodies. We did an at home dinner night with a bunch of different items we found, I love doing this kind of dinner. So please Caviar and Bananas, if you’re reading this….please please please come to California. All of these restaurants offer gluten-free options and make it so easy to dine if you have a gluten allergy. They were more than willingly to make any necessary adjustments to the dishes. From both trips I’ve found that Charleston happens to be an extremely gluten-free friendly city to eat in if you have a gluten allergy. Looking for a place with the cutest patio ever, boutique shopping, plus frosé? ….then The Skinny Dip has you covered! This is the perfect place to come if you’re on a girls trip because you can shop till you drop (hello, Kiel James Patrick goodies) + so much more. Beware, you are much more inclined to spend frivolously after a glass or four of their frosé…trust me from experience, haha! If you’re looking for a great view of Charleston then this rooftop bar is your place. It’s often very crowded so if you can try to reserve a table ahead of time. I always like to try at least one cocktail at each restaurant/bar I go to and the Pavillion punch here was a refreshing option during the afternoon heat. Just like the name, this bar/restaurant definitely makes you feel like you’re stepping into a speakeasy during the prohibition era. We went on a Saturday night and this place was definitely hopping. If you’re looking for a place to grab a good drink and dance (there are DJs on the weekend) then this place is for you after 10pm. If you’re not looking for that, definitely go before 10pm. Bonus about Prohibition is that there is a super cute patio in the back. This place is perfect if you’re looking for craft cocktails and small bites to eat. The menu is filled with all different types of cocktails that you’re sure to find one you love. I went with the French 75 and there are no complaints here. This cafe was just down the street from our Airbnb so it was super convenient for us but is definitely off the beaten path. Being there in November they offered seasonal fall items like a pumpkin spice latte. Hands down, the best PSL I’ve ever had! You can’t go to Charleston without a stop at the the iconic Rainbow Row. After stopping here and taking a swarm of pictures you can take a nice walk along the water front since it’s just down the street. Just a quick trip over the Ravenel Bridge you’ll find yourself in this charming coastal city along the Atlantic Ocean. I definitely recommend taking a day trip over her to enjoy the sandy beaches plus the darling restaurants and bars. (in fact, I stock pile #68 and #83). They make their own candles to sell but also sell tons of other collections of candles. I could spend an entire morning here and be perfectly content. So if you’re a candle lover you’ll love this place too. There are some seriously amazing places to stay in Charleston between hotels, AirBnB, etc. I’ve stayed in both a hotel and Airbnb and think both are great options depending on your trip. The Mills House is where I stayed during my first visit to Charleston. It’s pink so what’s not to love!! They host a happy hour every evening for guests of the hotel, need I say more?! The location is hard to beat, it’s within walking distance of almost everything you’ll want to see in Charleston. For my girls trip we opted for an Airbnb to have our own rooms and a little more space than a hotel room can offer. I personally think this is a great option for a large group. We stayed at this home and loved it. It’s a traditional old Charleston home with a side entrance porch and backyard. The house itself was very uneven (especially upstairs) but I honestly think that added to its charm. It was a bit farther than we thought it was from downtown but nothing that couldn’t be fixed with a 15-minute walk or less than 5-minute Lyft ride. 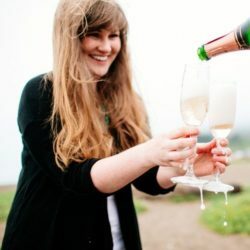 If you’re looking for more recommendations on Charleston then you should check out Julia Engel of Gal Meets Glam travel guide to Charleston because she has some great spots that I’ll definitely be stopping by on my next trip. It may have taken me 10 months to get this guide up, but better late than never, right? After putting this guide together I’m now itching to go to Charleston….brb while I try to convince my husband to go back this November!